Home / Nawabzada Liaquat Ali Khan / Prime Minister / Quaid e Azam / Scotland Yord / Syed Akbar / Syed Akbar, a Character of Liaquat Ali Khan’s Murder – Killer or Victim? Syed Akbar, a Character of Liaquat Ali Khan’s Murder – Killer or Victim? Usually it is believed that Syed Akbar was the killer of Nawabzada Liaquat Ali Khan, first Prime Minister of Pakistan. But there is need of more investigation to search for reality. Assassination of Liaquat Ali Khan was a big conspiracy and there may be big names behind Syed Akbar for this misdeed. Nawabzada Liaquat Ali Khan was assassinated on 16 October, 1951 at Company Bagh/ Liaquat Bagh. It is also stated that Syed Akbar belonged to Gujrat but he was an Afghan Feudal Lord who was settled in Gujrat before independence. He got remuneration from British Government and then from Pakistani Government. Syed Akbar came to Rawalpindi about a week ago with his young son before the incident. He was just a character of the whole murder story. Super Powers of that time may be involved in the death of Liaquat Ali Khandue to his popularity and role in Muslim World. Air Commodore M. K. Janjua wrote in his article that bullet was fired from a gun which was only kept by the Pakistani Police and American Officials at that time and moreover the direction of the bullet was from up to downward because it was fired from the roof of a room adjacent to main gate of Liaquat Garden. While Syed Akbar was present in the crowd and if he fire the gun the direction would be from down to upward. A Policeman killed Syed Akbar, the suspect to give a drop scene to the story. An Inquiry Commission was also made to investigate and Scotland Yard was also involved but it is still a mystery that who was the actual murderer of him. 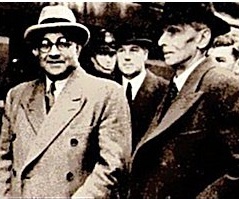 It is said that oil and airbases were the reasons behind the assassination of Liaquat Ali Khan. Liaquat Ali Khan was born on 1st October 1896 in Kernal. His father Nawab Rustam Ali Khan was a landlord. Nawab Rustam Ali Khan was awarded with titles of Rukan ud Daula, Shamsher Jang and Nawab Bahadur by British Government. Liaquat Lai Khan studied at Muhammadon Anglo Oriental College, Aligarh and Oxford University, UK. He became a member of All India Muslim League in 1923. He didn’t left any property behind, his account balance was only few hindered rupees at the time of death. However he had immense property in India but he didn’t claim it in Pakistan. Even at the time of death, his dress was very old and ragged.